WHAT ARE RELIEVED TIPS IN A ROTARY VALVE? The rotor of a rotary valve is usually made by welding plate steel to a shaft (“I'm talkin' 'bout Shaft!” …eat your heart out Isaac Hayes) to create “vanes”. 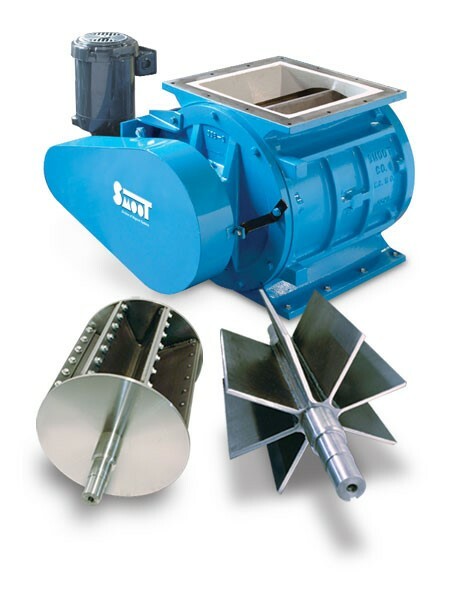 Most cast rotary valves on the market today have ~8-vanes. At the time of welding to the shaft the opposite side and the end sides are left as “plain” as a Charlie Brown jelly sandwich . This typically results in a wide surface area between the rotor tip and the housing or end plate. This can be a plus or a negative depending on the situation. If your material is “sticky”, such as starch based or sugary materials (Sugar, Sugar… ba-da-da-dadum-bum….awwww Honey, Honey), this relatively large surface area gives more room for product to build up on the end of the tip. When this happens rotary valves often tend to make a high pitched “squealing” sound (Often high enough that it would annoy Ned Beatty on a bad canoe trip) or even lock-up all together. To help make this go away, manufacturers of rotary valves often bevel the tips (aka create “relieved” or “knife” tips) to a 1/8” or even 1/16” wide land to reduce the surface area available for the product to build on. Note: For proper use, this additional machining should be done to both the top and sides of the vanes for maximum effectiveness, as product can also build between the side of the vanes and the end plate. By doing so, allowing the rotor turn much more freely (Now I’m Free! Free Fallin’…) and that’s sweeter music to all of our ears. For more information on Rotary Valves Click Here.